Customer Support - CIMTechniques Inc. Thank you for being a SmartScan (formerly CIMScan) customer. 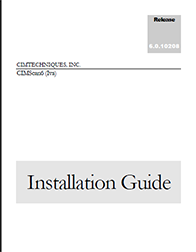 Below you will find manual downloads and useful troubleshooting information. Q: I keep getting a COMM LOSS error, what can I do to fix it? come out of COMM LOSS error. If not, call us and we’ll guide you from there. not an Alarm. Where is the Alarm? report to include more time. Q: Why am I receiving emails but not phone notifications? work hours. Your work hours will determine whether the system will use your Work or NonWork information when notification takes place. If you have multiple pieces of contact information in a single field (e-mail AND phone), make sure they are separated with a semi-colon (;). above was for a Verizon cell phone, the message would need to go to 2225551234@vtext.com. Q: Why am I getting so many phone calls for the same monitoring point? Select an Action drop-down to disable Alarm Processing for a set period of time. kept open or to be closed by unchecking it).